Three young suspects knocked over dozens of headstones in a 225-acre cemetery Tuesday and vandalized them with derogatory graffiti, authorities say. 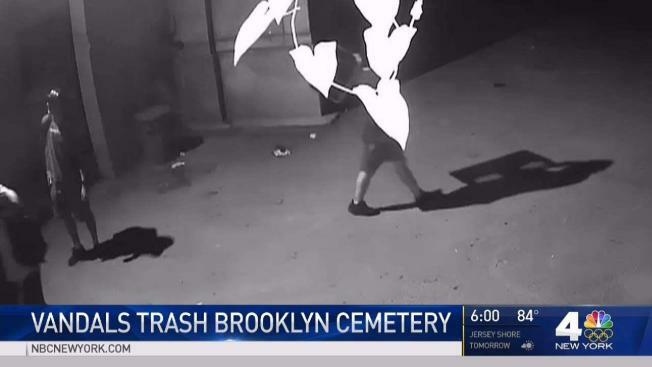 The vandals, believed to be between the ages of 16 and 19, were spotted just after midnight in the Cypress Hill Cemetery along the Brooklyn-Queens border, police said. Officials said they toppled more than 70 headstones and defaced them with racist graffiti targeting Asian and black people, then broke into a mausoleum and damaged the marble stones on the front of about 15 vaults. Biased graffiti was also left there. Police say these three suspects vandalized the Cypress Hill Cemetery. Awilda Santiago, whose 30-year-old son is buried at the cemetery, rushed from Long Island to check on his grave when she heard of the vandalism. "We lost him in 2009 and I come every week, and I heard about it this morning," she told News 4 Wednesday. "I'm like, oh my God, I have to make sure he's OK."
She said his grave wasn't damaged. "It was a relief. I'm glad he's OK. It's sickening what's going on," she said. Stacey Cullen, an official at Cypress Hill Cemetery, said the damage left her dumbfounded. Cleanup is underway, and the cemetery says there will now be security there 24 hours a day. Police released surveillance footage (above) of the suspects. Anyone with information about them is asked to call police. The NYPD’s Hate Crimes Task Force is investigating. "These young kids, I just hope someone recognizes them and calls the authorities. This is sickening. A cemetery. Come on," said Santiago.